Fans in Guadalajara also watched the game against South Africa on outside big screens. 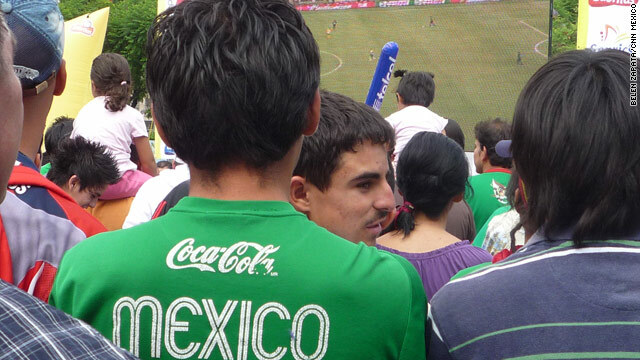 Mexico City, Mexico (CNN Mexico.com) -- Thousands of Mexicans woke up early Friday to watch their national team play the inaugural match of the World Cup 2010 against the host, South Africa. Hundreds of fans had started to gather in the Zocalo, the main square in the capital, Mexico City, from midnight, where three big screens had been installed to see the game live. Local authorities had estimated that up to 60,000 people would show up in the Zocalo, and by halftime they confirmed that 52,000 people were cheering for the Tri, the nickname for the Mexican national squad. Mexico came from behind to draw the game 1-1. "We played well and Rafael Márquez showed strong will," said Moisés Vázquez, who watched the game in a local bar. Coffee shops and bars in the Avenida Insurgentes, the longest street in Mexico City, were not at full capacity though. "Since eight in the morning, the cars were hunking the horns, showing support to the Mexican team, and many people were wearing the official shirt, but the streets kept their normal activity", said Mauricio Torres, a CNNMexico journalist. Students and teachers were able to watch the game in schools after the government granted special permission. And about 60 percent of companies said they would allow their employees to watch the games at work to minimize absenteeism. The government also allows public servants to watch the game in the public offices. This was the fifth time that Mexico has played in the first game of the World Cup finals and the second time it has drawn the opening match. The first time was against the Soviet Union in 1970.